GasBuddy is a tech company based in Boston that operates apps and websites based on finding the most accurate, real-time fuel prices at more than 140,000 gas stations in the U.S., Canada and Australia. They also offer software solutions to convenience store owners via their B2B initiatives (formerly known as OpenStore). The GasBuddy app is a GPS-based application program for smartphones and tablets which provides prices of nearby gas stations from user-submitted data, as well as through partnerships with other companies and directly from station operators. The app has both Android and Apple's iOS versions. GasBuddy connects drivers to their Perfect Pit Stop™, and serves the full lifecycle of being on the road. It starts with GasBuddy's database of more than 140,000 gas station convenience stores, including real-time fuel price information, station locations and offerings, along with ratings and reviews. GasBuddy's payments service, Pay with GasBuddy, entitles drivers to save on every gallon of gas they pump. Now, you can save even more at the pumps, while helping your friends save too! The next page shows your unique invite code to share. 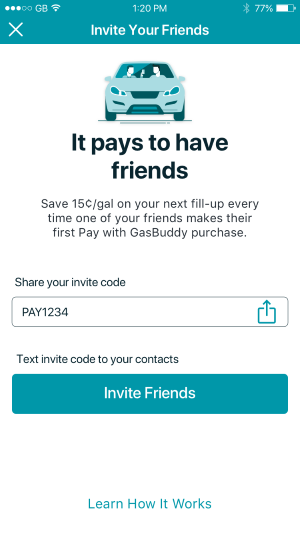 If your friends use this code during enrollment for Pay With GasBuddy, once they make their first purchase using the card, you receive an additional 5¢/g discount, bringing your next transaction to a total savings of 10¢/g. But I have lots of friends. Does this mean I can just add them all up and save maybe several dollars per gallon? Referral discounts can be used once per transaction. 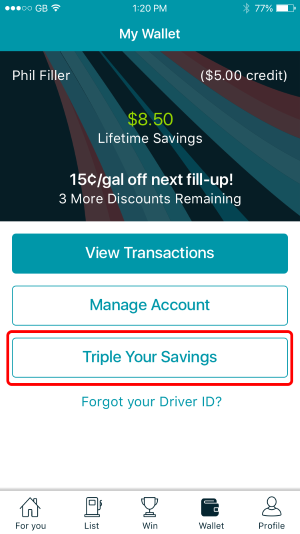 So, if you have 10 friends all sign up using your referral code, and all use Pay With GasBuddy™ for the first time, you will still get the additional 5¢/g additional discount. You will just use them each individually, as they cannot be combined.